…there are no difficult horses, only misunderstandings between horses and people. 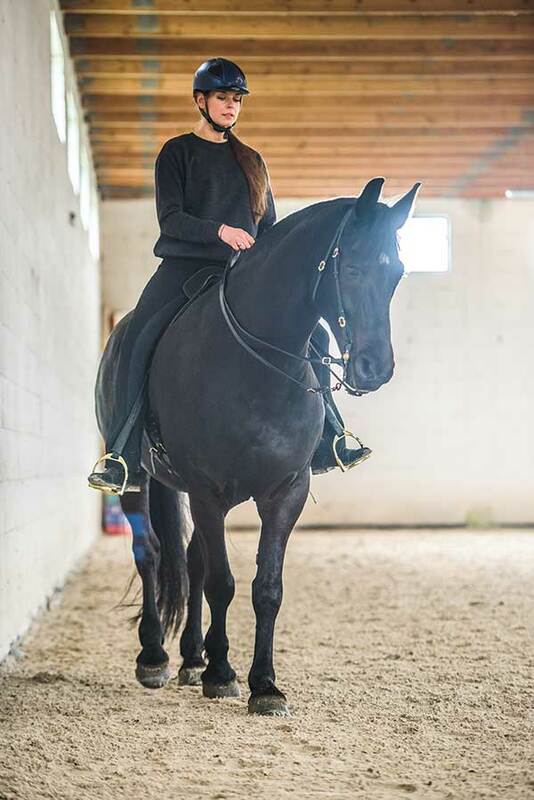 Originally from Germany, I teach horses and riders in the Academic Art of Riding, a method based on the ways of the old masters which was rediscovered, compiled and refined by the Danish grand master Bent Branderup. My motto is that there are no difficult horses, only misunderstandings between horses and people. 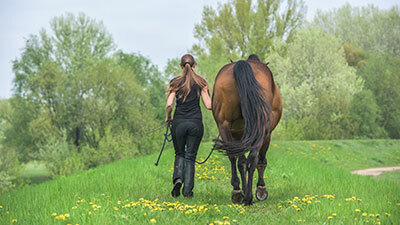 It is my goal to help horses and riders to a soft communication and to help them discover their path together. If you ever thought that riding should be fun, logical and effortless and that you would like to ride the kind of dressage that truly develops you and your horse, then you are just like me. I never gave up my dream of feeling like a centaur with my horse – as if of one body and spirit. And I am so happy that I have found a method that helps me to achieve this! A great opportunity for growth and inspiration. Meet people that share your passion and learn in a safe, supportive environment. Due to the rather unique personality of my dear horse Nazir, I began searching for a good classical riding education here in Poland, for a trainer who works according to biomechanic principles and takes the psychology of the horse under consideration as well. I could only find training focused on sports and competitions, which was out of the question for me, as I never saw riding as a sport but as an art. And I did not want to ride my beloved horse with a heavy hand and push him with my legs. These trainers only focused on the physical part and often didn’t have a logical training concept. The other thing I found were trainers who completely left out the biomechanic part and entirely focused on obedience exercises, often with way more pressure then I was ready to use. I promised Nazir that I would never break his spirit, even if that would have definitively be easier sometimes. So, basically, I was on my own and had to educate myself. What started out as a depressing fact turned out to be the biggest motor for my development as a horse riding instructor. I started to read books about classical horse education: Anja Beran, Phillipe Karl, Manuel de Oliveira, Dominique Barbier, Sylvia Loch, just to name a few. I tried out some of the concepts with Nazir, but since I didn’t have a trainer that could show me how it’s done, progress was rather slow. Then, in 2014, I read a book that changed everything for me: “Academic Art of Riding: A riding method for the ambitious leasure rider” by Bent Branderup. With every sentence I read, I thought, “yes! That’s it!”. I watched some of Bent’s online videos and was totally hooked. The flood gates opened and I discovered a whole new world of horse training that had everything I ever wished for! I saw on Bent’s website that it is possible to apply for an internship at his place in Denmark, which I did immediately. In July 2014, I drove all the way to Denmark for one of Bent’s public evenings so I could meet him in person and see him train. What I saw convinced me even more that I had found my way. I had never seen the art of riding on such a high level before. These horses wanted to shine for Bent. I asked about the internship and got the polite reply that all the places for 2015 were already taken, and that it would be advisable to first learn some basics with one of Bent’s trainers. Which of course made total sense. Bent even recommended some trainers to me of which he knew they take interns and do a good job education them. One of them was Marius Schneider, who actually lives only a 15min drive from my parents! I really liked how “normal” Bent and his wife Kathrin seemed and how patiently Bent answered all of my questions. Visiting my parents for Christmas in 2014, I had my very first lessons in the Academic Art of Riding with Marius Schneider. During one lesson of groundwork and another lesson of riding on a school horse, I learned more than in my entire equestrian life before! It all was so simple and yet, it seemed that it was knowledge that was almost forgotten. I knew that I wanted to bring this to Poland and spoke to Marius about the possibility of an internship. Back home, I tried what I had just learned. It was as if Nazir said “Thank you, this way I can finally accept”. I started to get to know Nazir better physically and mentally than ever before. Luck had it that a place as a working student for Bent Branderup became free in April 2015 and I gadly took it. From this moment on, I became a student of Bent Branderup and Marius Schneider and have never looked back. It is the most exciting journey of my life, a journey to a deeper and deeper understanding of the art of riding and of course myself. I hope I can inspire you to go out in the world and seek what is your heart’s desire. I promise you, it is worth every effort! In today’s world, with everything available on the internet, it is tempting to never leave the security of one’s own home. However, real development happens outside your comfort zone. Public evening at Lindegaard, Bent Branderup’s place in Toreby/ Denmark, 04.06.2014. Seminar: Equine learning psychology with Marlitt Wendt, behavioral biologist, Haltern am See, Germany, 25.10.2014. Training day at Gestüt Moorhoof – Marius Schneider/ Lüdinghausen, Germany, 23.12.2014, participant with school horse. Course with Bent Branderup, Radebeul, Germany, 31.01.-01.02.2015, listener. Working student for Bent Branderup, Toreby/Denmark, 30.03.-04.06.2015, horse Nazir. Working student for Marius Schneider, Lüdinghausen/Germany, 31.08.-30.10.2015, school horses Silvano, Brydee, Olymp. Course with Bent Branderup at Gestüt Moorhoof – Marius Schneider/ Lüdinghausen, Germany, 12.-13.09.2015, listener. Course with Stephanie Birkeland/ Norway, 31.01.2016, Warsaw/Poland, organiser and participant with horse Nazir. Working student for Marius Schneider, Lüdinghausen/Germany, 02.02.-28.02.2016, school horses Silvano, Brydee, Olymp. Training weekend at Gestüt Moorhoof – Marius Schneider/ Lüdinghausen, Germany, 27.02.-28.02.2016, participant with school horse. Course with Bent Branderup, Radebeul, Germany, 12.-13.03.2016, listener. Course with Stephanie Birkeland/ Norway, 21.-23.05.2016, Warsaw/Poland, organiser and participant with horse (Nazir & Weto). Course with Marius Schneider, 02.-03.07.2016, Warsaw/Poland, organiser and participant with horse (Weto). Course with Bent Branderup at Gestüt Moorhoof – Marius Schneider/ Lüdinghausen, Germany, 09.-10.07.2016, listener. Working student for Bent Branderup, Toreby/Denmark, 08-24.08.2016, horse Jette. Course with Bent Branderup at Gestüt Moorhoof – Marius Schneider/ Lüdinghausen, Germany, 17.-18.09.2016, listener. Training with Marius Schneider and Carina Dörfler at Gestüt Moorhoof/ Lüdinghausen, Germany, 18.09.-23.09.2016, with school horses. Sales partner training at La Selle, Dresden/ Germany and becoming a La Selle sales partner, 01.-02.10.2016. Training at Gestüt Moorhoof – Marius Schneider/ Lüdinghausen, Germany, 21.11.-23.11.2016, with school horses. Training at Gestüt Moorhoof – Marius Schneider/ Lüdinghausen, Germany, 20.11.-22.12.2016, with school horses. Working student for Bent Branderup, Toreby/Denmark, 01.03.-15.04.2017, horse Weto. Groundwork/longe Test passed 21.03.2017 with horse Weto in Denmark ? Course with Marius Schneider, 22.-23.04.2017, Warsaw/Poland, organiser and participant with horse (Weto). Helper at the event “Fair to horses” with Bent Branderup, Marius Schneider, Sabine Oettel, Christin, Diana and Wolfgang Krischke, Christofer and Rebecca Dahlgren, Gestüt Moorhoof/ Lüdinghausen, Germany, 26.-28.05.2017. Course with Bent Branderup at Gestüt Moorhoof – Marius Schneider/ Lüdinghausen, Germany, 30.09.-01.10.2017, listener. Training at Gestüt Moorhoof – Marius Schneider/ Lüdinghausen, Germany, 02.-03.10.2016, with school horses. Course with Marius Schneider, 28.-29.10.2017, Warsaw/Poland, organiser and participant with horse. Working student for Bent Branderup, Toreby/Denmark, 01.11.2017 – 03.12.2017, horse Weto. Course with Marius Schneider, 07.-08.04.2018, Warsaw/Poland, organiser and participant with horse (Weto). Training week at Gestüt Moorhoof – Marius Schneider/ Lüdinghausen, Germany, 21.-25.05.2018, with own horse. Course with Bent Branderup at Gestüt Moorhoof – Marius Schneider/ Lüdinghausen, Germany, 26.-27.05.2018, participant with horse. Summer Academy in Denmark, 01.-04.08.2018. Signing into the Knighthood of the Academic Art of Riding, as first squire from Poland. October 2018: Sales Partner of Barock Flair and Bent Branderup Products. Course with Marius Schneider, 20-21.10.2018, Warsaw/Poland, organiser and participant with horse. Trainer Meeting in Denmark, 15.-17.01.2019. Bent Branderup Trainer Licence for 2019!!! Course with Marius Schneider, 06-07.04.2019, Warsaw/Poland, organiser and participant with horse. Working student for Bent Branderup, April/ May 2019. Course with Kati Westendorf 15./16.06.2019, Warsaw/Poland, organiser and participant with horse. Summer Academy in Denmark, 07.-10.08.2019. 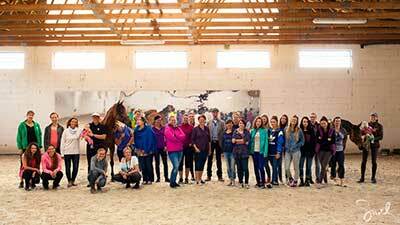 Course with Carina Dörfler, 14./15.09.2019, Warsaw/Poland, organiser and participant with horse. Course with Marius Schneider, 16./17.11.2019, Warsaw/Poland, organiser and participant with horse.